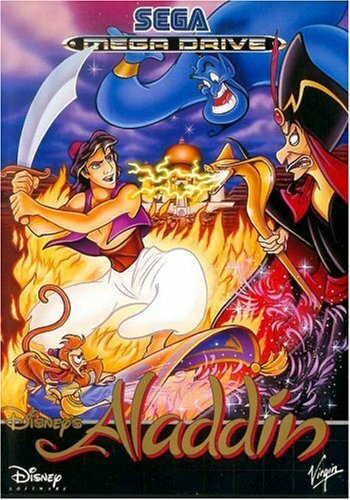 Aladdin follows the plot of the film fairly consistently, featuring key scenes, with just the right balance of artistic licence and the humour of the film. It features 16 bit renditions of all your favourite Aladdin songs, plus some written specifically for the game. The controls are tight and responsive, Aladdin responds to what you do, when you do it. The collision detection is also perfect, so you don’t fall through a platform because you missed a particular pixel. The amount of detail put into Aladdin’s animation is immense! Seriously, look at the sprite sheet!!! The action is fluid (coupled with the controls), when you fail it is because you failed. It isn’t the game cheating you, it isn’t unfair. It is you missed the jump, now brush yourself off and do it again. 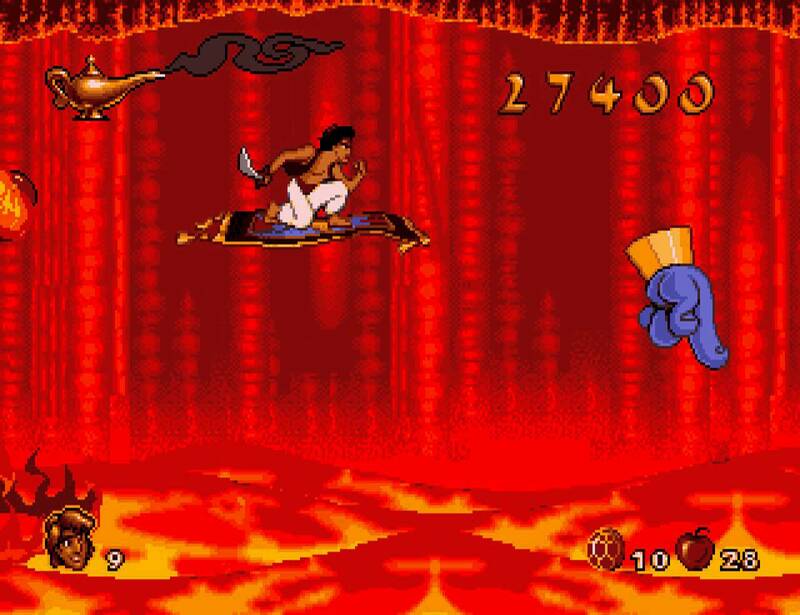 The great animation doesn’t stop with Aladdin either, all the enemies have idle animations, or joke animations. Throw an apple at guard, and hit him just right? His pants fall off! The “fat guard” stuffs his face with food, guards stumble on hot coals, Razoul challenges you, and snake charmers play the flute. This all add to the world you inhabit, it feels like the world exists without you. Enemies are not just stood in attack mode, they have “lives” the world feels lived in. Actually playing the game, there is none of those cheap game extending techniques common in 8/16 bit era, the “levels where you have to do a pin point precision jump after a 4 minute chase at the end of a level” which inevitably meant failure (I’M LOOKING AT YOU LEVEL 2 OF THE LION KING). Each level has 3-4 check points, so if you die, you can quickly retry sections without causing you to rage out, and while you most likely wont need them, you also get a fair few continues. The game can be completed in less than 20 minutes, but will typically take 40 minutes to an hour if you’re remotely competent. There are difficulty settings, (practice/medium/difficult). On medium, you get 5 lives and at least 2 continues from level 1 (i tried it out), and since there is an abundance of extra lives in the game, you really should be completing this game. When I re-bought the game 2-3 years ago I got to the final boss losing only 6 lives on the way. I found a copy of this at a car boot sale, and sadly it is a little faulty. I can play the game, it plays perfectly, but it will crash randomly. I have gotten to the final boss (about 2 hits from completion) and the game locked up. Which caused a “certain level” of (╯°□°）╯︵ ┻━┻), but I can’t stress how much I recommend this game. It is freakin’ brilliant. Gonna check this out sometime! Its going on the top of my must play Genesis roms!